I have Big Stitching Plans this weekend. By Sunday night, according to this weekend’s schedule, I will have spent 15 hours on embroidery, plying my needle and pulling my thread too many times to count. And by Sunday night, Birthday Bash will be – must be – finished. And then I’ll take you step by step through the stitches, materials, and project in general. What about you? Any stitching plans? Perhaps it’s too early to start binge stitching on a Saturday morning. No problem! 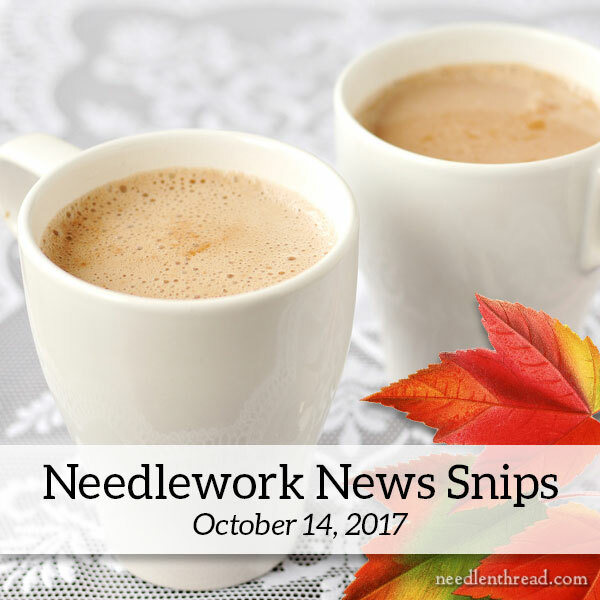 Pour up a cup of something nice and warm (it’s chilly here in Kansas), and let’s go for a little browse through some needlework news snips for this first half of October! First, let’s tie up some loose ends from recent articles here on Needle ‘n Thread. I reviewed The Art of Bead Embroidery earlier this week. It’s already a pretty popular book, and supplies are low in some places. If you want it, you should probably get it now rather than later, as I think it’s going to be one of those books that sells out of the first print run. In my review, I mentioned a few places that carry the book, but I forgot to mention that, here in the US, French Needle is carrying it. They were one of the first places I noticed it, and I even discussed it with Lisa. And then I forgot to include it as a source. You can find it here at French Needle for $41 right now. You can also find it available here through A Stitching Shop out of Denver, Colorado, where it’s available for $39.99. I’ve been in touch with the folks from Akonye Kena regarding the thread sets for Octoberfest, my latest project e-book which is available here. If you haven’t read about Octoberfest and the threads used on it, you can find out about it here. The second round of threads are still en route from House of Embroidery, so those of you who pre-ordered from the second batch of threads at Akonye Kena will receive them once they hit the States, which should be soon. They have about 50 thread packs still available for pre-order from this second shipment, so if you want the threads, you can still get them. You’ll find them available on the Akonye Kena website here. They’re still listed at the discount price of $12 (as opposed to $15). Also, don’t forget that all orders of regular-priced threads at Akonye Kena are permanently 20% for Needle ‘n Thread readers, with the discount code Corbet20 which you must enter at checkout. Speaking of orders and such, I’m now able to process orders for the e-books in my shop two ways: with PayPal for those who want to go that route, and without PayPal, for those who prefer not to use PayPal. Since some of you had requested the option of paying without having to go through PayPal, I thought I’d let you know! If you’re a fan of the Arts & Crafts Movement, and of William Morris in particular, chances are, you’re somewhat familiar with William’s daughter, May (named Mary at birth). First of all, here’s an article from The Guardian about May Morris that’s informative and has great photos of her embroidery, to boot! I just love the embroidered mittens in that article – they would be fun to reproduce! And, if you’re a die-hard May Morris / William Morris fan, you’ll definitely want to know that the book May Morris: Arts & Crafts Designer is available now at Book Depository. It won’t be available until later this month in the States, and at a considerably higher price, so you might check out the Book Depository listing if you’re keen to read a very thorough and excellent book about her, full of gorgeous photos of her needlework and other artistic pursuits, as well as informative and engrossing biographical and formative details plus history of the era. I’ll be reviewing the book in the next week or so, if you’d like to see it up close and personal. I haven’t finished reading it yet, but so far, I’m loving it. For now, suffice it to say that it’s a beautiful book and makes great reading. And, finally, let’s talk about dad. Over on Michele Hill’s blog, William Morris in Quilting, she’s got a post on her recent William Morris-related excursions, and in it, you’ll find some William Morris-esque figure embroidery – go take a look! At the Fitzwilliam Museum, a University of Cambridge museum in the UK, there’s an exhibit running until April 8th of 2018, called Sampled Lives, in which many of their rare and not-often-seen samplers are on display. You can read about the exhibit here. I’d like to see it. And the fact that it closes on my birthday must be a sign that I should see it. That said, I doubt I’ll see it, and so, as usual, I’ll have to settle for the exhibition catalogue, which is available here. In US dollars, including shipping, the price works out to just over $45. Not inexpensive for a book, but at least it helps support the museum, and it’s a wee bit less expensive than a visit to Cambridge (though perhaps not as exciting). You can find an article about the exhibit here, with some excellent photos of some of the samplers on display. Are you a fan of Weeks Dye Works embroidery threads? If so, you might be happy to know that they now have this conversion chart between Weeks Dye Works and DMC available here (PDF). I have a hard time working on crewel embroidery in hot weather. It just doesn’t seem to like me, when the temperatures are soaring in the 90’s and higher. Now that it’s autumn and there’s a decided chill in the air of a morning, my thoughts are turning towards crewel work again. And that means the Mellerstain fire screen is going back into the project mix. This is the last article I wrote about my progress on this project, but I did manage to get a little more stitching done on it during the colder days of last winter. I’ll be digging it out soon, re-acclimating my brain to stitching with crewel wool, and working on it when I can – which means I’ll be sharing progress again. I was very happy to see that Crewel Work Company has come out with another excerpt of the firescreen, for those who don’t want to tackle the whole thing. It’s the stag, and the design incorporates all the fun elements of a good crewel design – lots of stitches common to crewel work, some nice foliage and similar elements, an animal, some hills, flowers…. If you’re keen to work some real (as in, authentic) crewel embroidery, check out the Mellerstain stag kit! Over on Folk Costume & Embroidery, there’s an excellent article about heritage embroidery on the traditional costumes from Pokuttia and West Podillia in the Ukraine, with some interesting charts and explanations on how the embroidery from this region is accomplished. Neat stuff! And now, if I’m going to get in that 15 hours of stitching this weekend, I must fly! Wish me luck – I’d like to have a finish to show you next week! I hope you get to spend a bit of quality time with your needle and thread this weekend, too! See you Monday! I went to the Akonye Kena website and find it very confusing. Color A, Color B ? I have no idea what that is referring to. If I select Color (A/B/C) it returns me to the main product page. I wouldn’t know how to order from them. Thank you once again for your “Needlework News Snips.” Almost every edition opens up worlds I never knew existed. I did a lot of site reviewing and “bookmarking!” The Ukrainian embroideries and information about how they were done was wonderful. Thank you for working so hard to share all aspects of embroidery art. Great reading on Needlework snip bits. I really enjoyed the May Morris article and I would really like to visit the exhibition which looks really interesting and Walthamstow isn’t far from where I live in London. Thanks for all the information above and for sharing these needlework news bits with us and for the site links. Great news. I hope you manage to finish the Birthday Bash, good luck. I hope your needle flies this weekend! Mary, I have always enjoyed knitting along with surface embroidery and needlepoint but when I moved to AZ I can’t seem to knit anymore. Perhaps it will be cooler this winter and I can finish a couple of knitting wip. I too have the fire screen and I hope this is the year! I have a practice piece to finish first to be sure I can still do it. Good luck with the 15 hours. I want to finish Laura Perin’s Quail Collage this weekend. Here’s hoping my hours are enough! Thanks for the tip on the May Morris book; I just ordered it! Arts and Crafts embroidery is my favorite and most of the embroidery I do. I was lucky enough to visit the Fitzwilliam Museum and see the sampler exhibition with my Cousin. We didn’t know the exhibition was on until we got to the museum, which made even more special. We left our husbands to explore the rest of the museum while we spent at least the next two hours looking at the samplers with our magnifying glasses. Our husbands had to come looking for us!! I never did get to see what else was displayed in the museum! I was so thrilled to see such amazing work and so old. There was even a work book where the students had practised making a tiny mans shirt with intricate sleeves and collars. Hope you manage your weekend of stitching! Meanwhile, you do know how to tempt people. I’ll wait for your review of the May Morris – is it as luscious as the cover? – but that samplers catalogue is also very tempting. And Folk Costume and Embroidery – I love that site! So much inspiration there. Weekend stitching is a bit of cross-stitch and a bit of sort-of-Hardanger and a fair bit of knitting, but really I should be weeding. A glorious spring day here in Melbourne and the grass is growing, growing, growing. Previous Previous post: Berlin Embroidery: A New Look – and a Discount!